I hear my daughter speak new words every time and families and friends acclaim it to her creche, but I have spent a huge monthly check on data and I can see it starting to pay off. YouTube has been something I thought my daughter to use at a very young age and it has become her companion and teacher. But like most parents, I have become worried about un-filtered contents on the internet and as good as you tube might be, it might also become a hazard. We’re not the only ones: Families worldwide are watching millions of videos on YouTube and many have also raised concerns about contents. Lately my daughter saw a video of war ridden somalia and started crying, she asked me ” daddy, you love me and would not allow the horrible monster man to get me like these kids? ” I said which kids and then I quickly changed the video but the fear got stucked with me since then. You tube last year announced on working on a new way for kids to discover and explore videos on every topic in, well, the universe. However there was not too much news after that and many parents had to do loads of filtering on the router, that’s parents with IT knowledge but it did not help that much. In February last year YouTube Kids app was launched in the U.S.A, it was said to be built from the ground up with little ones in mind. The app makes it safer and easier for children to find videos on topics they want to explore, and is available for free on Google Play and the App Store in the U.S. Your 4-year-old may already be a swiping expert, but the app’s design makes it even easier to find Pocoyo or the latest episode of Sesame Street’s The Furchester Hotel. With larger images, bold icons and more, it’s fast and simple for little thumbs to navigate. And we’ve built in voice search so that even if your child can’t spell or type, they can still find videos of things they’re curious about. For years, families have come to YouTube, watching countless hours of videos on all kinds of topics. Now, parents can rest a little easier knowing that videos in the YouTube Kids app are narrowed down to content appropriate for kids. You can browse channels and playlists in four categories: Shows, Music, Learning and Explore. Or search for videos of particular interest to your family, like how to build a model volcano, math tutorials, the amazing (and endless) world of trains—and everything in between. Along with favorites from DreamWorksTV, Jim Henson TV, Mother Goose Club, Talking Tom and Friends and more, your kids can watch new series from YouTube channels they already like. Discover new facts about dinosaurs from National Geographic Kids; learn about technology from Reading Rainbow; or watch Thomas the Tank Engine leave the world of Sodor for the first time in 70 years to travel the globe. Plus, more new videos are coming soon from beloved YouTubers like John and Hank Green of the Vlogbrothers and Stampylonghead. 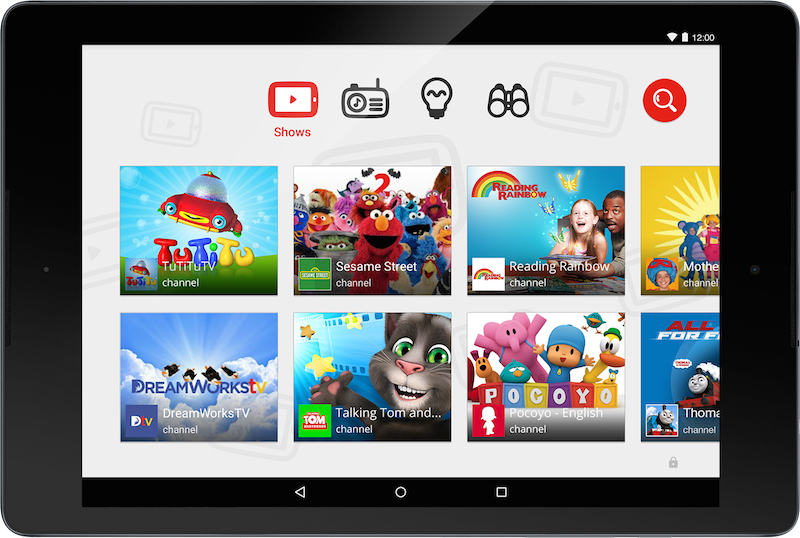 YouTube Kids is now available for use in the South Africa on Google Play and the App Store, and on Kurio and nabi kids’ tablets.